Dr. Ephraim A. Mukisira is currently the Director of the Kenya Agricultural Research Institute (KARI). He tookk over from Dr. Romano M. Kiome who, in December last year, was appointed the Permanent Secretary, Ministry of Agriculture. Dr. Mukisira was, until his appointment, KARI's Deputy Director of Research and Technology. His appointment caps 26 years of an illustrious research career in KARI. Dr. Mukisira began his research career in KARI in 1980 when he joined the then Scientific Research Division of the Ministry of Agriculture as a Research Officer. He rose through the ranks to become Principal Research Officer, Assistant Director and Deputy Director -Research and Technology and Director-KARI. Dr. Mukisira holds board positions in local and international bodies. In 1999-2003, he was a member of the World Council of Animal Production (WCAP). In 1998, he was elected to the post of the Secretary to the African Chapter of the World Association of Animal Production and from 1999-2000, he was elected to serve as the National Chairman of the Animal Production Society of Kenya. He is also a member of the Netherlands-based CTA Advisory Committee on Science and Technology. During his research career, Dr. Mukisira has authored and co-authored several scientific papers, some of which have been published in referred journals. He has also contributed to book chapters and presented scientific papers in local and international conferences. Two of these presentations won him meritorious awards by the Canadian Society of Animal Science and the European Poultry Conference. He has also won several scientific awards locally. Dr. Mukisira holds a Doctorate degree in Animal Science from McGill University , Canada . He also holds a Master of Science degree from Louisiana State University , USA and a Bachelor of Agriculture (Honors) degree from the University of Nairobi . 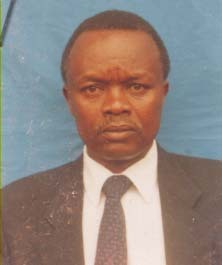 Professor Glaston Mwangi Kenji, BSc., M Sc., PhD. Natural products chemistry research eg search for biologically active substances from natural products. Mycotoxins in foods and feeds.